Meterite 2000 & 3000 Metering Valves | J. Dedoes, Inc.
Our Meterite family of metering valves cover a wide range of applications and materials, when the exact amount is an absolute must the Meterite is the perfect solution. Meterites are custom built to your needs and unlimited configurations are possible. Meterite 2000 series is capable of metering most materials with highly accurate dispense volumes from 3ml up to 750ml and higher. As with all our Meterites the seals are easily replaced and available in many different types. All Meterites can use a variety of ball valves and actuators to accommodate our customers needs making the Meterite a solid heavy duty industrial meter. Meterite 3000D series is a pump style meter that dispenses using pump presure, as one side is filling the other is dispensing giving a constant fill/dispense operation with no time waiting for refill. This unit can be built in many sizes and works great in greasing applications where continuious automated operation is required. 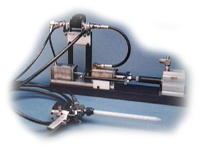 Meterite 3000 series is our two part metering dispensing systems. Built to our customer needs these meters are ideal for dispensing two part epoxies and other two part materials. They also come in a variety configurations and sizes. This 2-part meter works with two Meterite 2000's built in tandem with single air cylinder drive. Meterite 3000 series can accurately dispense materials with almost any ratio. 1 to1 or 10 to 1 this meter will do the job with no lead-lag.